Philbrick-James Library: Monday and Wednesday 1-8 p.m., Tuesday and Thursday 9 a.m. till 5 p.m., Friday 1-5 p.m., Saturday 9 a.m. till noon. The collection will continue throughout March. If you have questions, please contact Bonnie Heisey at 234-7272. This spring we’ll be offering Growing in God’s Grace 101 (3G-101), a five-session experiential series required for people who want to become Covenanted Members of DCC. The class will be after worship at 10:15 a.m. To participate, please sign up in the Great Room. The church season of Lent, when we prepare ourselves spiritually for Easter, is a call to renewed worship, study, prayer, repentance, and generosity. Our theme for Lent 2018 is “Listen: Hearing That ‘Still, Small Voice’ and Finding Your Own.” During worship services and our Lenten discussion series, we’ll hone our ability to hear God and discern our Spirit-inspired inner voice. •	7:30 p.m. Service in the sanctuary with prayer, readings, pastoral reflection, imposition of ashes, and worship music. Special “Come to the Table” fellowship meals at various members’ homes are taking place February through May. The purpose is to connect with new and old friends within our church family. Many people signed up in the fall to participate, but if you haven’t yet said, “Yes, I’ll come to someone’s home for a meal!” then contact Suzanne Steele (463-5858, steele1@metrocast.net) or another member of the Hospitality Team (Anne Crawn, Fred Hicks, Mary Higgins, Steve Pomainville, and Steve Scholz). Special note about parking: If you can walk a bit, please park in the Town Hall lot across the street to ensure that we have plenty of spaces for people who have a difficult time walking. 9:00 p.m. Those looking for peace and quiet on this special night before Christmas will appreciate our 9 p.m. service, when the Grace Notes trio will be with us, simple carols will be sung, and the Christmas story will be told in a meditative way. To purchase flowers to grace our sanctuary on Christmas Eve, please fill out the form available in Sunday’s bulletin or call the church and return it no later than December 17. Thank you! Jacqui Dion is looking for children age 4 and up who would like to participate in a sacred dance at the 5 p.m. Christmas Eve service. There will be four practices; dates and times to be determined. Please contact Jacqui with any questions: jacquidion@gmail.com. Thank you to everyone who has picked up a paper star describing a gift that can be purchased for a child in town. Gifts are due Sunday, December 3, unwrapped and with the star attached (can be dropped off at the church or the library). Also needed are donations of wrapping paper, tissue paper, gift bags, and scotch tape. Questions? Call Noelle Clark at 303-7513 or Faith Barry at 463-7800. On October 15, as one of five participating churches, DCC ‘s 19 walkers went the distance in the Greater Manchester/Londonderry NH CROP Hunger Walk. 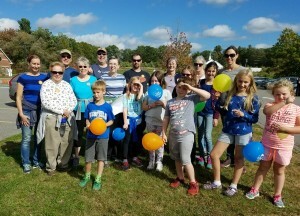 The walk raised $12,335 ($3,757.20 from DCC) and had a total of 54 walkers. Thank you to our enthusiastic walkers and generous donors in this expression of love in action. In addition, many thanks to Phyllis Langlois, DCC’s awesome CROP Walk leader. Due to the Holiday Fair the men’s monthly breakfast on November 18 will be held at Bob Spindel’s home from 7 till 9 a.m.
Any questions please Bob at 463-7268 or 303-0430.